I live near Penzance in Cornwall. Any way I have a field at the bottom of my garden which over looks Mounts Bay and I have decided to 'make' a vegetable garden. At the moment it is a 'field' so where do I start? That's where I hope you all will come in. My plan is to start off by marking out three 10' x 6' beds and apply 'Roundup'!!! not very organic I know but I must get rid of the grass and weeds quickly if I'm to do any planting this year! Then the plan is to find, beg or borrow a rotovator, preferably with a man attached - and 'dig' over the patches. We might then be ready to start? In the mean time I can pour over seed catalogues and dream - at least until this cold weather has gone. Comments for Starting From The Begining. I shall enjoy seeing how your garden develops, make space for a bird table and a seat so you can rest up and just enjoy looking at all those beautiful vegetables coming up. Barbara, your garden setting is so beautiful! I live in a suburb of Oklahoma City, Oklahoma, in the U.S., and I just had to tell you that, for 37 years, I lived next door to a woman named Elizabeth Joan Pickens, who was raised in Cornwall. I believe she still keeps a cottage there. Though she didn't have a green thumb on either hand, her husband, Carson, who died last year, was an accomplished gardener. Yes I did at first think of raised beds, but then remembered the problems I had in my garden beds. When growing and harvesting potatoes the beds gave no room to lift or earth up, so have decided to go on an entirely different track. In view of the extremely bad weather we have had here in Penzance during the last week - I still cannot believe we have had temperatures of -6.5, I repeat, minus 6.5... that is unheard of. We have been lulled into a sense of false security. For years we have grown all these southern hemisphere plants, which are now looking very sad, Echiums, Aeoniums, etc. - sorry I know this is about Vegetables - but it's very shocking. Anyway, back to veg. I think I am going to grow more veg in my poly tunnel, but would like some help like when can I sow carrots, dwarf beans, lettuce crops? Help please.... there doesn't seen to be any decent books on the subject. A great post on your new venture and you certainly look as though you know your onions. I like your comment on the rotovator coming with an enclosed `man` - don't forget we only do one task at a time :-). 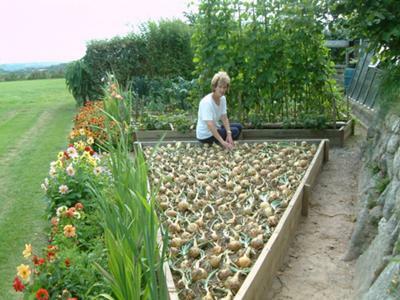 A thought on your new garden beds - are they going to be raised garden beds? Even if they aren't, the conventional width is 4 feet for ease of reaching to the middle from either side - as I say, just a thought! Have a great gardening year.